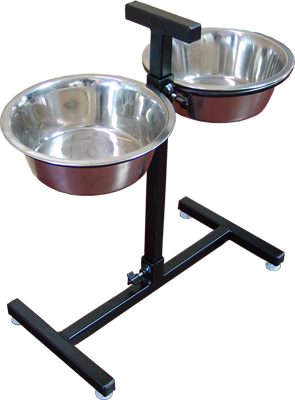 The height of an elevated dog bowl allows large dogs to eat comfortably without putting strain on their spine, which aids in digestion. Neck strain is also minimized when your pet can eat from a dog bowl that stands at his chest height. Dogs with arthritis appreciate the ease of using an elevated bowl, too. Standard bowls force the dog to bend at the joints to eat, which may cause discomfort. This feeder holds two 3 quart bowls, which are included. Height is adjustable from 5" to 20" (top of bowl). Perfect for growing puppies who push around food bowls. A handle at the top make this feeder easy to move. Disassembles without tools into three pieces for storage or transport.